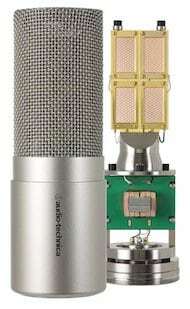 Condenser microphones (also known as capacitor microphones) are well-known for their excellent audio quality and sensitivity. They typically have wider frequency response and better transient response than dynamic microphones. They require power to work either through batteries or by phantom power and are preferred for studio recording or other environments where background noise can be controlled. 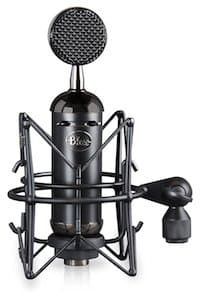 We’re going to be focused on large diaphragm condenser microphones commonly used in home studios for recording voice, singing, podcasting, guitar, and more. Some models have more than one mic capsule, allowing them to record different pickup patterns from the standard cardioid pattern typically used with single-capsule models. 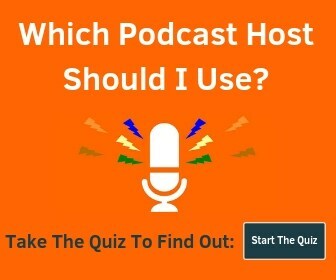 This tends to add a bit of additional cost – and I’ll highlight those options as well. The cost varies widely so we’ll organize them by price so you can choose a mic that fits your budget. You’ll find mostly mics that use XLR connections, but I’ll also highlight a few USB condenser mics as well. As you likely noticed, many of the mics over $1,000 on this list come from Neumann. They invented the standard for phantom power and have been making world-class microphones since the 1920’s. 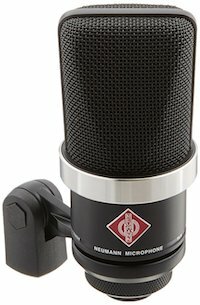 The Neumann U 87 Rhodium Edition is a special 50th-anniversary edition of the classic U 87. It has cardioid, omnidirectional, and figure-8 pick patterns. I’ve said this in other posts, but this mic and all the higher-end mics in this section are not for beginners and work best with quality preamps and proper room acoustics. The Audio-Technica AT5047 is a unique design that uses four rectangular diaphragms making up a single element – essentially making it 4 matched microphones in one – that makes up twice the surface area of a 1″ diaphragm. This will handle extreme SPL, has a wide dynamic range, and has a very low self-noise level. Comes with a custom shock mount and case. 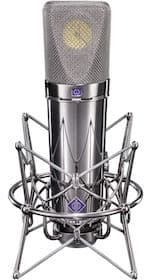 Neumann’s TLM 170 R is a multi-pattern large-diaphragm condenser with 5 different settings: cardioid, hypercardioid, wide-angle cardioid, omnidirectional, and figure-8. What’s unique about this model is that there is a 6th setting – “R” – that allows you to remotely control the pickup patterns from the included power supply. It also has a high-pass filter and -10dB pad switches. The Neumann TLM 67 is another multi-pattern condenser that includes cardioid, omnidirectional, and figure-8 pickup patterns. The “67” number means this is based on the legendary U 67 from the ’60s. It also includes a -10db pad and a high-pass filter. You’ll get the EA 87 shock mount shown above as well. Blue’s flagship mic is the Kiwi. It is a multi-pattern condenser and has an impressive 9 polar patterns. The main patterns are cardioid, sub-cardioid, super-cardioid, omnidirectional, bidirectional. There are 3 different sub-cardioid patterns and 3 different super-cardioid patterns. Comes with S3 shock mount and cherry wooden box. 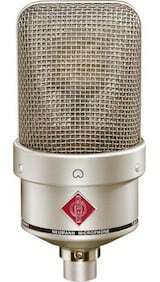 Neuman’s TLM 49 is a cardioid condenser designed and tuned for vocal recording. Like all the “TLM” mics, it is transformerless. If you want a nice warm and rich sound in a high-end mic, this is an excellent choice. Brand new from Sony and just announced at the January 2018 NAMM show. Not to be confused with the C100 video camera, the Sony C-100 is a multi-pattern high-resolution vocal condenser microphone. It can record omnidirectional, cardioid, and bi-directional and has an insane frequency response from 20Hz to 50kHz. Also included are a low-cut filter and a -10dB pad for high SPL recording. Included with the microphone are a windscreen, suspension mount, and a carrying case. 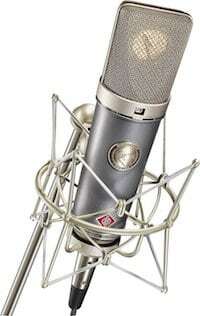 The Neumann TLM 103 has been widely used in many professional recordings as well as high-quality home studios since its release in 1997. 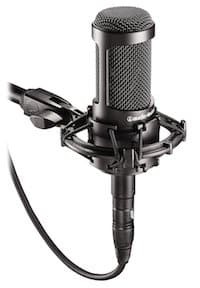 It is a cardioid condenser tuned for voice recording of all kinds with an extremely low self-noise of 7dB-A. It was inspired by the U 87. You can get the set (pictured) for about $200 more that comes with a shock mount and aluminum case. Blue is probably more well-known for their lower end mics these days, but they have many excellent high-end options as well. The Blue Blueberry is their signature large-diaphragm cardioid condenser. It will work equally well for vocals, guitar, strings, and brass instruments. Comes with a wooden box and S2 shock mount. Not only is their 9 polar patterns, but you can choose a variety of different pads (0, -6dB, -12dB, -18dB) and several low-cut filters (0, 40Hz, 80Hz, 160Hz). It has very low 6dB-A self-noise level and works great for everything from vocals to guitar to brass. 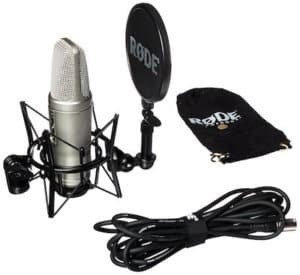 Comes with shock mount, metal carrying case, pop filter, and windscreen. 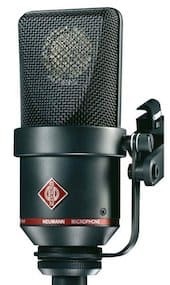 The Neumann TLM 102 is a cardioid LDC that is offered in Nickel or Black and comes in a nice compact design. It has an extremely high max SPL of 144dB, 132dB dynamic range, and is designed to enhance vocal recordings with a slight presence boost above 6kHz. This is an excellent high-end cardioid-only mic that would make a perfect addition to your studio. 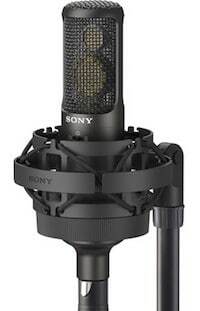 Keep in mind it doesn’t come with a shock mount, so you should strongly consider pairing this with the Neumann EA 4. 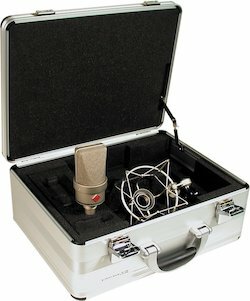 The Audio-Technica AT4050 is essentially the multi-pattern version of AT4040 (look in under $300 section for that one). This dual-diaphragm condenser can be used in 3 different polar patterns: omnidirectional, cardioid, and figure-8. It has a frequency response from 20Hz – 18kHz, roll off at 80Hz, and a -10dB pad. Comes with the AT8449 shockmount, dust cover, and case. 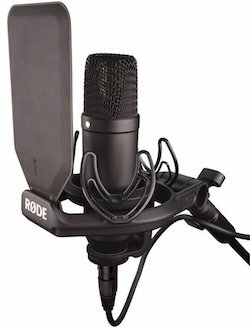 If you want a multi-pattern mic under $500, the Rode NT2-A is what you want to get. 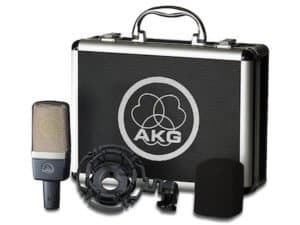 As the picture indicates, this is a kit that includes the mic, shockmount, pop filter, XLR cable, and pouch. Take note that this mic is fairly heavy (860 grams – or nearly 2 lbs) so you’ll need a quality mic stand. This could easily be one of the best values per dollar on this page. It is a cardioid-only version of the C414 (you’ll find that in the “under $1000” section) and has a max SPL of 156dB (that’s loud! ), low noise level, a -20dB pad, and a 160Hz low-cut slope. Whether you’re recording amped guitars or vocals, the C214 can handle it. Comes with the case, spider mount, and windscreen shown. 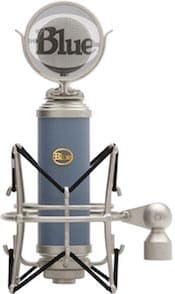 The Blue Baby Bottle SL is an upgrade to the original Baby Bottle (non SL version) that works well for recording everything from piano to strings to vocals. It’s a cardioid condenser with a neutral bottom, rich mid-tones, and smooth top end. Onboard switches include a -20dB pad and 100Hz high0pass filter. Comes with the shockmount and wooden box shown. Similar to the Baby Bottle above, the Blue Bluebird SL is a cardioid mic with a 100Hz HPF and a -20dB pad. It will work great for home studios when plugged straight into a USB audio interface. Also comes with shockmount and wooden box. The Audio-Technica AT4040 is a side-address cardioid with low noise levels, high max SPL, and a wide dynamic range. A -10dB pad and 80Hz high-pass filter are both switchable on the mic, and you’ll get a shockmount, dust cover, and carrying case in the box. 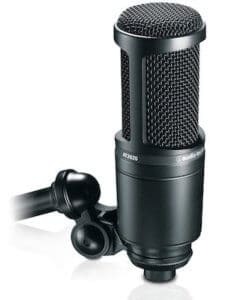 This is a great intermediate-level mic for recording a wide variety of applications. The Rode NT1 is an updated version of the NT1-A. It has a 1″ condenser capsule with a cardioid pickup pattern. The self-noise level is an extremely low 4.5 dBA this is easily one of the best mics under $300 – and probably one of the best under $500 if you don’t need additional pickup patterns. You can buy the microphone by itself, but for only $20 more you can get the Rode NT1-KIT that includes the SMR shockmount with custom Rycote Lyre suspension system and dual-layer stainless windscreen. If you need a USB audio interface as well, Rode recently came out with the Complete Studio Kit that includes the NT1 Kit plus their brand-new AI-1 single-channel interface and a premium XLR cable for $349. As of January 2018, you can’t even get this interface by itself. Lately Blue has been pushing the Blackout Spark SL as a great gaming and streaming microphone as well as a perfect podcasting, voice-over, and YouTube mic. It’s a solid choice for an entry-level cardioid condenser that doesn’t need a preamp to run. It has a 100Hz low cut filter and a -20dB pad. They make both an XLR version and a USB/Lightning version. The Audio-Technica AT20 series is a staple in the recording industry. You’ll find the AT2020 a little further down the page, but the AT2035 would be my choice under $200. It’s perfect for recording podcasts, streaming, or singing with a nice smooth and natural sound. It comes with a shockmount & pouch, has an 80Hz high-pass filter, and a -10dB pad. We’ve mentioned the Blue Yeti quite a bit here on other posts because of its popularity and excellent price point. It’s a multi-pattern USB microphone that costs just over $100, but can be commonly found for less during Black Friday and Prime Day. It has a headphone jack with volume control, gain control, mute button, and polar pattern selector all onboard. You’ll want to check out our recommended Blue Yeti accessories to get the most of this mic. The Audio-Technica AT2020 is a workhorse in the voiceover industry and is an impressive cardioid mic for under $100. 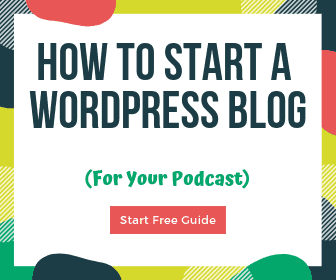 It has a high 144dB SPL, is built solid, and won’t break the bank – perfect to get started podcasting, streaming, and singing. 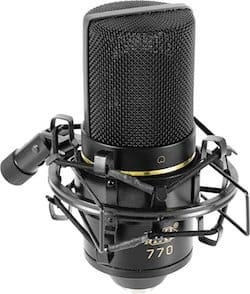 The MXL 770 is the cheapest XLR condenser mic on this list but that doesn’t mean you can’t get a decent recording out of it. Sure, there are cheaper mics, but usually from less well-known brands or from cheap knock-off brands – avoid those! It has a -10dB pad switch, 150Hz HPF, case, and shockmount – pretty impressive offering from MXL if you’re looking to get a low-budget cardioid condenser. Don’t forget to grab a boom arm to mount it. 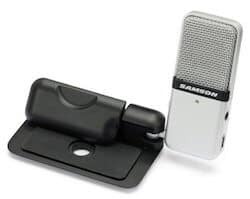 Not exactly designed for any serious recording, but the Samson Go Mic is perfect to throw in your bag to upgrade your laptop’s built-in microphone on the road. It’s a USB mic that has a headphone jack for monitoring and folds up small. It also has 2 pickup patterns: cardioid and omnidirectional.